She also wore a diamond riviere and diamond earrings. 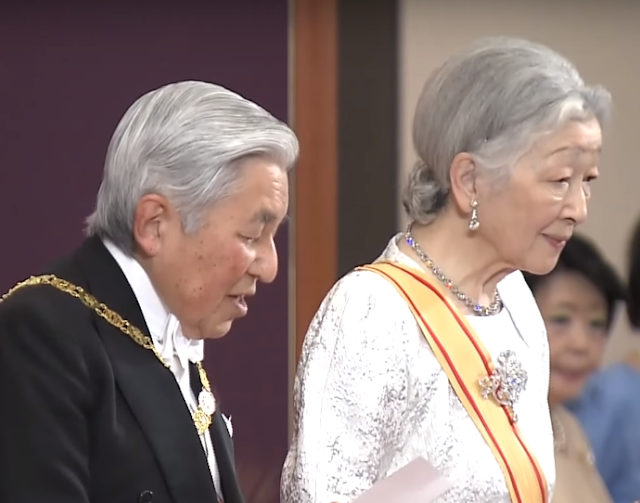 As per usual, Crown Princess Masako attended the event privately, but didn't take part in the public portion of the ceremony. 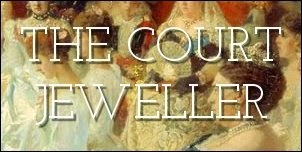 A photograph was taken of her as the crown princely family arrived; she wore the Pearl Sunburst Tiara with its mirrored necklace. The rest of the imperial ladies were there, assembled in their usual glittering line. Next after the empress were the Akishinos, the wife and children of the emperor's younger son. 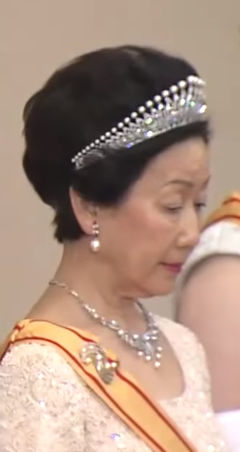 Princess Kiko wore her wedding tiara with its mirrored necklace and a coordinating brooch. Her elder daughter, Princess Mako, wore the parure she received for her 20th birthday. 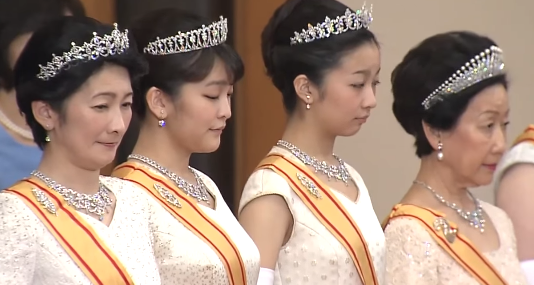 Princess Kako also wore her 20th birthday parure, which was made by Mikimoto. Next in line was the representative of the Hitachi family: Princess Hanako, wife of the emperor's brother, Prince Masahito. She wore the diamond and pearl tiara and necklace that she's worn on previous white-tie occasions, plus pearl earrings and a brooch set with pearls. After the Hitachis come the Mikasas. The emperor has one living uncle -- Takahito, Prince Misaka -- who turned 100 years old this year. 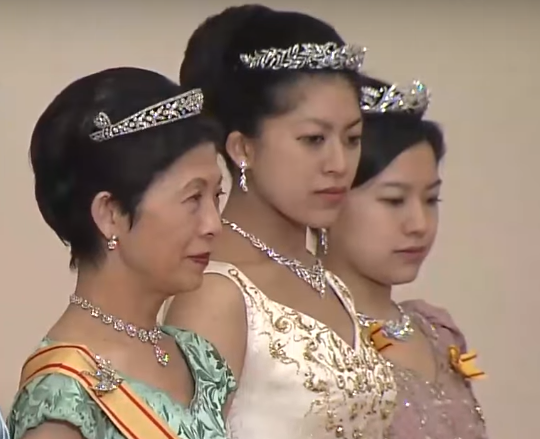 The woman in white above is one of his daughters-in-law, Princess Nobuko (formally known as Princess Tomohito of Mikasa), and her two daughters, Princess Akiko and Princess Yoko. 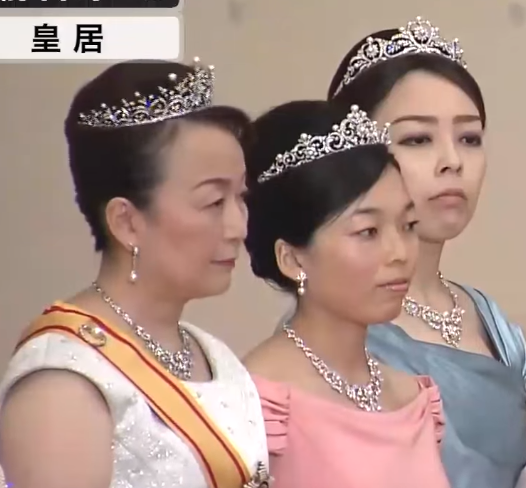 All three are wearing the diamond and pearl parures that they wear each year at this reception. 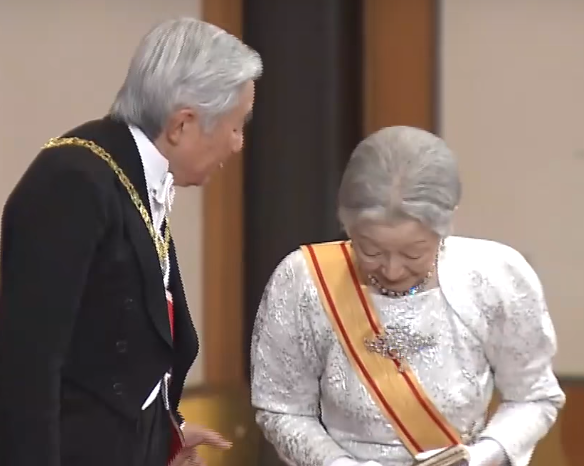 The emperor's uncle has another daughter-in-law: Princess Hisako, the widow of Norihito, Prince Takamado. She may look particularly familiar, because she has represented the family abroad at a number of royal events, including the weddings of Princess Madeleine and Prince Carl Philip of Sweden. I'm really intrigued by Hisako's tiara -- it's one of three that we've seen her wear, and it has a decidedly early nineteenth-century vibe. Her lovely diamond bird brooch was worn at Carl Philip's wedding. 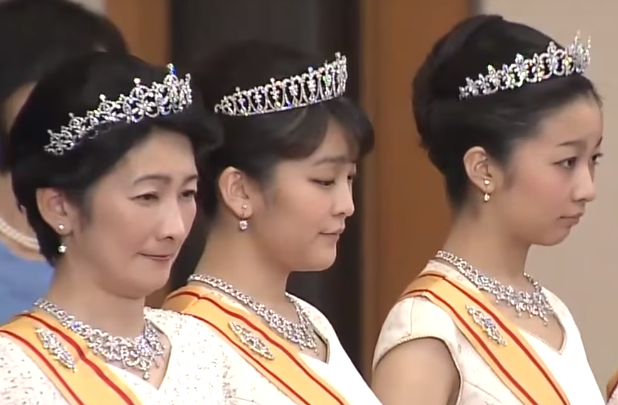 Both of Hisako's unmarried daughters -- Princess Tsuguko and Princess Ayako -- are wearing their usual parures, made of tiaras, earrings, and necklaces with wreath designs. They're some of my favorite sets from the imperial collection.